Thanks for the great feedback. It's intended to be quite flexible, but it also requires some work to find and enter all data sources. Awesome Miner only uses Difficulty, Block Reward, Exchange rate and Exponential factor to calculate coins per day and the revenue for a coin. That's all properties needed to do all the calculations in Awesome Miner. The other properties like NetHash and Block Time are not required at all - they are only displayed for information purposes. This is also the reason why it's never been possible to manually modify these properties. About the blue text for coins. It's only on the Coins tab you will see the coin name displayed in blue color in the 'Coin' column - if the coin has custom properties. As soon as you have enabled "Change Properties" for a coin, it should show up with blue name. It may not be that easy to see the small color change, but it should be there. From an Awesome Miner point of view the information is downloaded but contains much more than just a plain number. A bit strange that they call this an API (in the URL) where it's also including HTML in the response. I will have to investigate if this can be supported in a good way. Update: I took your advice and only look on the first line if there are multiple lines for plain text sources. A correction to support these kind of URL's will be included in the next release. No additional configuration will be required, it will just work. issues the HTML PUBLIC DOCTYPE "- // W3C // DTD HTML 4.01 // EN"
1) I noticed the example in the documentation for BitCash didn't work out-of-the-box. 2) For CoinCalculators and Litecoin - the JSON properties are actually case sensitive. 3) From what I can see, the Zcash API example works fine. Which property did you try to load? You do need to specify a JSON property expression like "difficulty" or similar. I also noticed that on the dashboard screen, it shows my active miners as one number but under active devices, under "ASIC" it has the wrong value - my guess is that it relates to the T15, like it sees it as an active miner but not as an ASIC for some reason. Regarding dynamic loading from local coin node's JSON-RPC which uses POST, can you give an example on whether it is possible to read the data with current v6.2.9 release please? Before I made the change for Antminer T15 in the recent development release 6.2.9, the ASIC count wasn't including this miner like you describe. However, this should be working fine since the latest development version. I looked into this scenario and there was no way of including the username and password in the HTTP authorization header. I've just added support for entering a username and password for the HTTP request and tested it with a local wallet - and it works fine. Thank you patrike! This is marvellous! This resolves the issue with some public explorers with API caching issue (chainz.cryptoid.info - and consequently, CoinCalculators using it) and cause delay in reported difficulty which is far different than actual "current" value. Time to setup a dedicated wallets node box for good potential PoW chains without a (good) explorer while waiting for next AM release (Perfect Timing!). Saves API bashing public services as well and potentially getting oneself banned/flagged by them. sorry but maybe I am misunderstanding - are you saying it should be corrected now? or will be corrected with next update? I have no updates to install and says it is using most current version but I do not see the temps for the T15 nor do I see it counted as an ASIC on the dashboard screen. Still having the API disconnect every few minutes as well. sometimes it reconnects other times I have to reboot all the miners. I may have to stop using AM and find another way to report miner details. I feel that with all the reboots that I am just losing money because the miners are being stopped and rebooted simply so AM can see them - when in fact they are working fine. You can confirm your current version in the lower left corner of the Awesome Miner main application. For the Antminer API - did you follow my previous suggestion about testing with a completely different mining pool? I've had a number of cases in the past where some specific mining pools could cause the problems you describe with miners showing up as Disconnected after a while - although they still were mining on the pool. What happens here is an issue on the Antminers when mining on some pools begin to respond slower and slower to monitoring applications (API requests). After a while the responses are so slow (or not given at all) that Awesome Miner will simply consider the miner to be Disconnected. Please note that this is an issue on the Antminer under certain conditions - not an Awesome Miner issue. For this reason you will run into the same issues even if you would test with another monitoring solution. This is also why I keep answer with the same suggestion all the time, about doing troubleshooting and testing with another mining pool, so we can confirm the issue. Thanks! There is one setting in Awesome Miner that might help a bit, where you can have Awesome Miner wait longer for the responses from the Antminer. Please go to the Options dialog, Advanced section, and increase the "Miner API connection timeout" to 10 seconds for example. This will however not solve the main problem, only make it show up less frequent. You can try this if you want, but my main suggestion is still about the mining pool. yes, Kano.is, Slushpool, BTC.com pool, ViaBTC pool also tried several other SHA-256 pools that are not bitcoin pools. I get it no matter what the pool is. I understand what you mean but it does not solve my issue - I need to be able to remotely see what each miner is doing without having the need to reboot them. Before I just had the Antminer screens open - one browser window per miner (so you can imagine a lot of windows) and each window set to a 15 second refresh and this worked fine except for the need to switch between so many windows. I will try the miner API Connection timeout - I think you suggested that once before and it might have worked - I do not recall but maybe one of the updates reset it back? and I just need to go in and change it again. I will play with the settings this weekend and let you know. Thanks for the update. Please keep me updated on any findings with the timeout. Is it only a reboot of the Antminer that makes it show up correctly again - I suppose a restart of the Awesome Miner application doesn't resolve anything? Thanks! I did increase the timeout - already had 2 miners report as disconnected on AM while still showing active on pool - however, within a few seconds AM showed them "reconnected" so they are still dropping but they seem to get re-added back. I waited for one to disconnect and then restarted the AM software, it does not reconnect - the warning changes from the API warning to a simple disconnected warning. In the Summary tab in the lower part of the screen you will find a property called "Response time", indicating how fast the ASIC miner is responding to monitoring requests from Awesome Miner. If the miner shows up as Disconnected, you will not see anything here, but otherwise you will see a value here. The value should be less than 500 ms all the time. 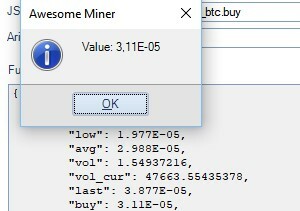 Please select the miner and click go to the toolbar: Tools -> API Report. If the ASIC miner respond to any requests, you will have more than 100 lines of information in the response. If no response, you will just have a few lines with the name of the API commands that Awesome Miner sent to the ASIC miner.